Perhaps you’ve heard of the phrase monkey mind? Just as monkeys swing from branch to branch, our mind has a tendency to do the same thing, if we allow it to. For example, a small worrisome thought may swing from branch to branch, eventually gaining enough momentum to become anxiety or panic. The antidote to monkey mind is something called mental management. It’s an often overlooked skill that allows us to tame the monkeys in our mind, if you will. One of my favorite stories, which is aptly titled Two Wolves, serves as a simple reminder of the power we all possess to manage our thoughts. You see, the way in which we feed the wolves is by the quality of our thinking. Fear and anger don’t just appear out of nowhere. They are influenced by the thoughts that precede them. Simply put, if I’m consumed with fearful thoughts, I’m naturally going to feel a heightened sense of fear. My thoughts are essentially feeding the fear. Conversely, if I choose to focus on thoughts of gratitude, then it’s gratitude I will feed. For what it’s worth, I spent a large part of my life feeding the negative wolf. Over time, it simply became habitual and negative thinking ultimately became my default response. I would often obsess over worst case scenario outcomes, which of course always fueled other worries. Let’s just say that monkey mind was a fairly common experience for me. Over the last several years, as I’ve made a commitment to teach mental management strategies to others, I’ve come to realize that it’s ultimately a choice. No one is hardwired at birth to feed the negative wolf, but rather we are conditioned to do so over time. 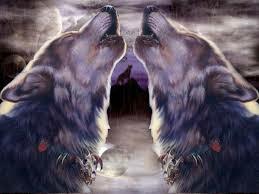 Simply put, the more time we spend feeding the negative wolf (consciously or subconsciously), the more it will win. I invite you to spend some time thinking about your thinking over the next few weeks. I can almost guarantee you that you’ll find some habitual thoughts that you’ve had for years, which clearly aren’t feeding the positive wolf. Once you’ve recognized the negative thought, practice replacing it with a new one. It may seem difficult at first, but remember that sustainable change doesn’t happen overnight. You’ve spent years thinking in certain ways, so the only way to accomplish change is to take the necessary baby steps. This is the essence of mental management.